How can cells that contain the same DNA end up so different from each other? That is not only a difficult question for science to answer, but also a challenging one to represent visually. 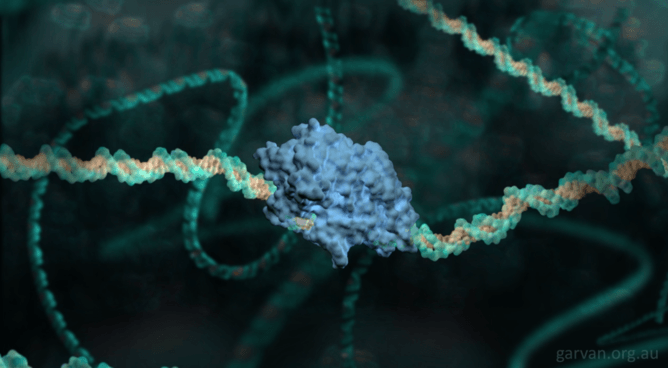 It is also the question I posed at the start of my latest biomedical animation, called Tagging DNA, which visualises the molecular mechanisms behind epigenetics. It specifically looks at a process called methylation, where methyl groups are added to DNA, thus changing which genes are switched on and which are switched off. This is one of the processes that enables the same static DNA to produce different types of cells throughout our bodies. Tagging DNA: Mislabelling the Cancer Genome. It is one of six animations created so far as part of the VIZBIplus project, established as part of the Inspiring Australia Unlocking Australia’s Potential Initiative. With slight nervous excitement – since this was the first time anyone except for myself had actually seen the whole thing – I narrated my animation live in June at the Science Reimagined event as a part of the VIVID festival in Sydney. Narrating in this style seemed to bring life to the animation and engage the audience in a way that I couldn’t achieve with a pre-recorded version. It’s no trivial task making such complex science accessible and engaging. When creating a biomedical animation, I use the tools of Hollywood, such as colour, movement and narrative, to capture the interest and attention of an audience not necessarily interested or engaged in science. Yet, while the overall aesthetic needs to be appealing and awe-inspiring, this should not be at the expense of scientific accuracy. There is always a balance between accuracy and artistry, and this remains a challenge for every biomedical animation. I encountered another aspect of this challenge when creating Tagging DNA when I needed to explain and show concepts that are not yet fully understood, even among scientists. Together with Professor Susan Clark from the Garvan Institute of Medical Research – who is a co-author on this article – we were careful in explaining the role of the enzymes methyltransferase DNMT and TET in regulating how genes are switched on and off. We had to do this in a way that accurately showed their properties and functions, yet still fit within the storyline. We also had to carefully orchestrate the enzyme TET’s appearance and the associated narration to ensure that its potential role in methylation and cancer was not overstated, given what we know about it. The evidence today suggests that TET enzymes play a role in facilitating demethylation during development. However, their specific role in cancer remains elusive, except to say that the genes encoding TET enzymes are commonly mutated in cancer. It is also well accepted that DNMT enzymes are not the only players that contribute to the methylation landscape. And we still need to understand more about the complexity of the methylation and demethylation machinery, and that is what we wanted to make clear by including TET in the animation. The enzyme TET binding to a segment of DNA. The challenge was introducing this in the animation, knowing that the majority of the audience would not have deep scientific understanding of the topic, but appreciating that some viewers would. This is a classic example that illustrates how narrative can be a powerful tool to guide a viewer through a complex topic. However, when not used carefully, it can inadvertently cause unintended implications or link ideas that are not fully scientifically resolved. By comparison, we have a much better understanding of the method by which the enzyme DNMT operates. In the animation, I drew from what we know about the structure of DNMT, and show how the enzyme directly binds to unmethylated DNA, flipping out a section and enabling the transfer of a methyl group. This process has been captured by x-ray crystallography and recorded in the Protein Databank (PDB). To create the animations, I have the luxury of using the 3D animation software Autodesk Maya, which is industry standard for Hollywood companies such as Pixar. I also use Molecular Maya and Cell Pack, which are plugins that have been specifically designed to allow proteins in the PDB to be imported directly into the 3D animation software. These tools are essential when telling molecular stories accurately. In my animation, the DNA itself is also an accurate model, complete with structural details such as the major and minor groove, thermal or Brownian motion of atoms and 10.5 base pairs per 360 degree turn of the DNA. The base pairs are even colour-coded to represent the genetic code. Molecular animations can be brightly coloured and breathtakingly beautiful. One could easily believe that they are portraying fictional worlds of fantastical creatures and wonderful environments. It is the underlying scientific rigour and attention to detail that helps the audience build trust. As a creator of such animations, the greatest satisfaction comes in watching a viewer realise that they are watching something that is real, and something that is actually occurring inside their bodies at that very point in time. I invite you to watch the animation again and imagine just that. Kate Patterson is Senior Research Officer: Biomedical Animator and Visual Science Communicator at Garvan Institute. Susan Clark is Senior Principal Research Fellow at Garvan Institute.